This year for his European teachings, to honour the 700th Anniversary of the Karmapa lineage Rinpoche will be teaching on the works of the first Karmapa, Dusum Khyenpa. These are ancient teachings, yet relevant to our modern Western lives, focussing on peace of mind, compassion and the interdependence of all beings. Rinpoche is visiting many centres in the UK, from Scotland to Wales, London and ending with 3 days of teachings in the south of England. 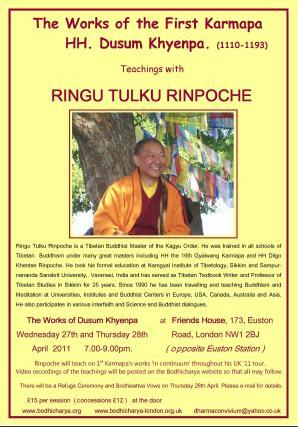 BBG Bosham is honoured to be hosting Rinpoche on the 1st and 2nd of May. Please click on the image above for details. Click on these images for details of his visits to Southampton, Oxford and London. Rinpoche will be signing his latest book on Chenrezig, the Bodhisattva of compassion at all venues. This entry was posted on April 18, 2011 at 7:27 pm and is filed under HH Karmapa, News, Ringu Tulku Rinpoche, Teachings, Tibetan Buddhism. You can follow any responses to this entry through the RSS 2.0 feed. You can leave a response, or trackback from your own site.